Complete all the necessary fields of the Add Contact form found inside the Contacts menu manually. Contact type: Choose whether the contact is a client, a supplier or both. A client contact is available for invoices, credit notes and estimates. The payments made by a client can be found under 'payments received'. Suppliers, on the other hand, are the contacts you may use to add a bill in Elorus -paid off by amounts under 'payments sent'. A supplier credit may also be used to add a supplier credit (note), should you receive one. The currency in which future documents will be created. If you have transactions in multiple currencies, see the related article here. The language in the contact will receive notifications and email reminders. The default template that will be automatically selected when invoicing the contact, which also defines the documents language. If no default template has been set, the organization's default template will be used. And a default tax that will be automatically applied onto the documents when invoicing this contact. Concerning contact addresses, you can choose between 3 types: Billing (HQs), Shipping (warehouse or other delivery address) and Other by clicking Add new address. Specifically for billing/shipping types, if you enter the corresponding addresses, they will both appear automatically on your documents. > The ability to automatically add additional addresses to your documents is not supported. If you enter more than one shipping address, only the 1st will be displayed on your documents. To be able to email invoices and estimates to your customers through Elorus or give them access to the client portal, you need to enter a valid email address. ... and all of the contact selection fields across in the application. 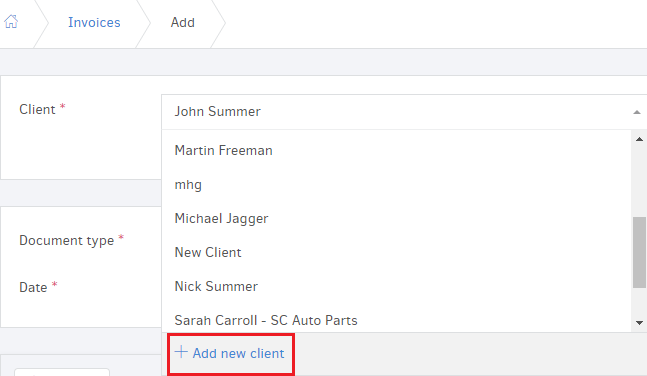 By clicking Add new client / supplier a window will open similar to the "Add contact" manually form (see above) in which you can enter the contact information. By clicking Submit, the contact will be saved automatically in the Contacts menu and will be selected for the document at hand. Create a new contact based on the company’s VAT number. Elorus searches the company in the European Union’s online database (VIES system), checks the VAT number for validity and automatically creates the contact. You can create a contact from every nation - member of the European Union! 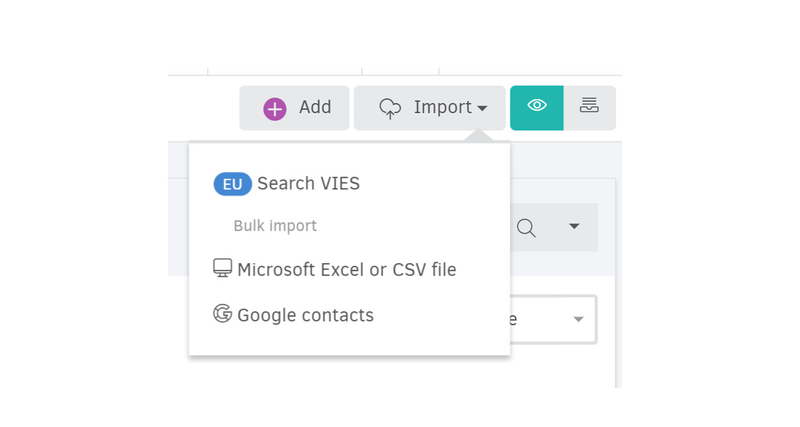 Note: To be able to use the feature, you need to integrate with VIES through "Settings-> Application Settings-> Integrations"
Given the fact that you have your suppliers/clients list in Excel or CSV file, you can upload it following a very simple process. From the main menu select "Contacts -> Import -> Microsoft Excel or CSV file". In case your database is stored in an Excel file, you may download a sample file to get an idea of how the columns are supposed to be like, so that it will be uploaded correctly. However, Elorus will try to parse and import any uploaded file. When your file is ready to be uploaded, select "Choose file" so you can trace the file in your system. Once you click on the desired file press the "Upload file" button to start the uploading process. Should any errors occur during uploading, Elorus will provide you details about them so you can make adjustments and try again. Each file must not exceed 3MB in size and cannot contain more than 1.000 contacts (lines). If you upload the same contacts with some modifications, Elorus will not update the existing ones but instead create duplicate entries. Fields requiring a "type" (address type, type of number, etc.) must have data in the respective columns too (address 1/2, number 1/2). If for some reason these are empty, delete those contact lines from your file and transfer them to separate file, in which you must completely erase the type and number columns in the new file. Import your Google contacts in bulk. To begin, click "Contacts-> Import-> Google contacts"
In case you own an Android Smartphone, you can sync your contacts with your Google account beforehand and load them in Elorus within a few “clicks”.